Contains all the full length Bathurst races from 1980 to 1989. MOTORSPORT at Mount Panorama boomed in the electrifying 1980s and this huge box set captures the decade perfectly with a plethora of Bathurst racing action to keep you on your couch for hours on end! 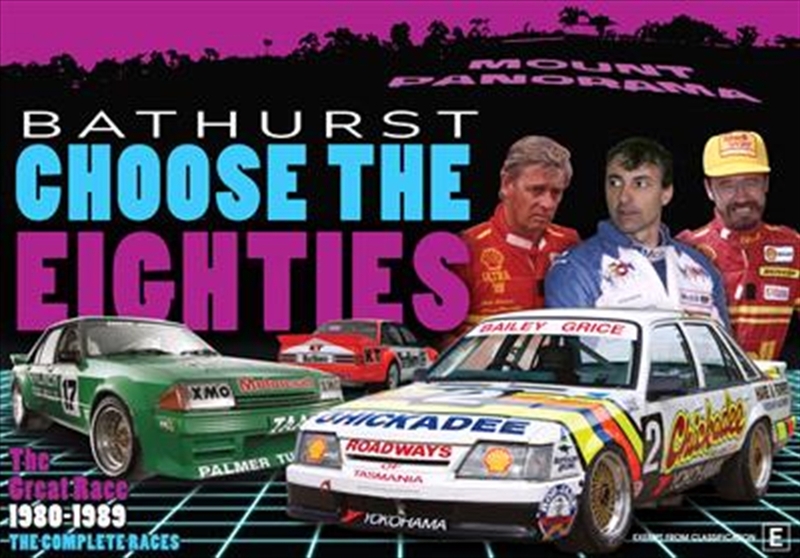 Every Bathurst 1000 race from 1980 to 1989 - in full and including racing action not televised on the Seven Sport TV telecast of the day - is featured within this amazing box set of DVDs, making this a golden trip down racing memory lane. All the memorable Bathurst cars are here - the mighty V8 Falcons and Commodores, the turbo Bluebirds, Sierras and Skylines, the rotary Mazdas, thoroughbred BMWs, purring Jaguars and so much more! All of the big names are featured in these races too with Brock, Moffat, Johnson, Richards, Skaife, Grice, Longhurst, Perkins and many, many more from this golden era of racing going head-to-head at Bathurst. Lock the door, grab a drink, get comfy on the couch and bolt yourself in for a trip back to the 1980s where fashion and hairstyles were questionable but the action on-track was simply brilliant!